Waiting for my plane to Tianjin.. I miss my wife so much. I hope we'll get relocated to Tianjin real soon so that I can don't need to miss her. And it's her dream to come and stay in China. God could you expedite our request to move to Tianjin? I just came to China last week, stayed in Singapore for less than a week and here I am again. God help me not to be so whiny. This is the job you gave me, I want to appreciate every part of this job. I want to be a thankful son not a brat to you. Thank you for this opportunity to amass wealth, to travel places I have never been, to meet people that favor me. Certainly You are the One who can create such an opportunity for me. Last year this time, I was just a tuition teacher at Modular. 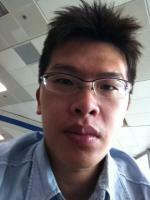 Today I sit here in Shenzhen airport as a country manager, son of a shareholder of a private equity firm. I'm so blessed, so blessed. I don't think I'm greedy to just ask that my wife be with me when I work here in China.